Last week I talked about the Middle Ages influencing the runways of Fall 2015, and today we see that trend continue in terms of a recurring texture, luxurious velvet in rich shades. Slowly but surely we are seeing fashion evolve from minimalism and again appreciate luxurious materials and stunning details. In the past, velvet has conjured images of childhood Christmas parties (not exactly the epitome of fashion) but that is a thing of the past thanks to the stylish designs of today's fashion designers. Christopher Kane, in particular, has taken velvet to the next level with cool iridescent colors and velvet accents. Emilio Pucci and Delpozo both took on-trend wide leg pants to new heights by doing them up in velvet. If you're looking to incorporate this trend into your wardrobe, I suggest starting off with cool separates—think velvet blazers and wide-leg pants—before working up to chic party dresses. Or, if you just want a hint of velvet in your look, there are plenty of velvet shoes and purses to choose from! 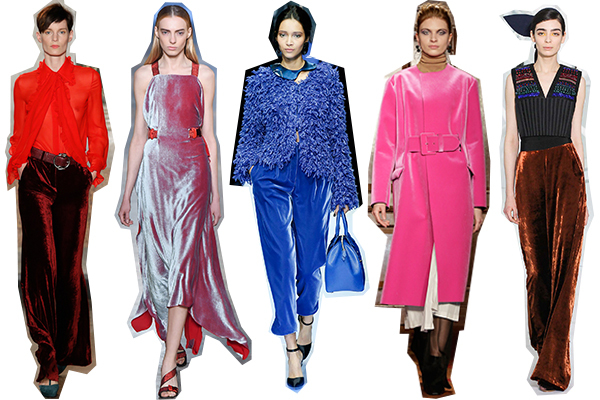 Will you be rocking velvet this fall?